"Staff is very friendly and welcoming! The waiting area is clean and clutter free." "Great Dentist, the doctor really cares about your concerns and does a thorough job..."
"Always a great experience with Dr. Marquez and staff." "He is great with adult as well as children. I would really recommend Dr. Marquez." "The staff was really friendly and I would recommend Dr. Marquez as your dentist." Francisco Marquez, DDS, provides his expertise to the families of Santa Fe Springs, California, at Santa Fe Dental. Decades of training and experience equip him to handle your preventive, cosmetic, periodontal, and restorative dental needs. As a primary care provider, Dr. Marquez welcomes both adults and children into his practice. Previous pediatric patients commend his attentiveness to children, while adults feel reassured in his capable hands. From routine exams to more complex oral surgeries, Dr. Marquez’s patients appreciate his well-rounded expertise. As a practitioner of restorative dentistry, Dr. Marquez offers aesthetic-friendly fillings, bridges, root canals, and dentures. He can further improve your smile with teeth whitening solutions, veneers, and other cosmetic treatments. He performs many periodontal procedures under the same roof, so you don’t have to visit multiple dentists. As an established part of the community, Santa Fe Dental feels like home to the residents of Los Angeles County. 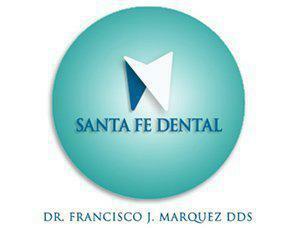 Dr. Marquez invites you to join the Santa Fe Dental family. At Santa Fe Dental, we accept most major insurance plans. Here is a short-list of some of the most popular plans we accept. Please contact our office if you do not see your insurance provider listed. "My family gets their dental work done here and we love it. The staff is warm and friendly and Dr Marquez is extremely kind." "Great dentist. Dr. Marquez provides great services and I have been coming to him for years. I would recommend him to people of all ages, he does great with kids." "Dr. Marquez has been my dentist for 10 years and I can't imagine going anywhere else. He and his staff are extremely friendly and I recommend them to all my friends." "Dr. Marquez is a class act and probably one of the best dentists I've had. His staff is also exceptional." "I've had a root canal and 2 wisdom teeth extractions done by him and I'm amazed at how gentle he is. I also love his office staff, Very nice people." "Dr Marquez is kind, friendly, and cares. Makes me feel comfortable even when I'm nervous. He helped my daughter get out of her fear of the dentist."